← HIGHLY RECOMMENDED: 2008 Brampton Shiraz by Rustenberg Wines. Stellenbosch, South Africa. 14.5% ABV. $11.95. HIGHLY RECOMMENDED: Torres, Sangre de Toro, 2009 Red Wine, Catalunya, Spain. Garnacha and Cariñena blend, 13.5% ABV. $11.99. WELL. Let me tell YOU. It began to reveal its beauty and quiet strength about 45 minutes after decanting. Hallelujah! This one turned out to be hugely delicious, although more subtle than most Spanish wines we’ve experienced. Dark ruby, pink edges. Legs. Very sophisticated. Balanced, beautiful flavor and texture. Lush with oak. Medium-bodied, smooth, supple. Later: Lush, bright cherry and raspberry notes. Long finish at middle and back of tongue, a tiny bit of fire and spice at top of throat. Wine diamonds positively lined the decanter. This was a little disconcerting, but we’ve written about this in the past as being a sign of natural and very good winemaking. (See http://www.thefrugalwinesnob.com/?p=322.) Not only is it nothing to worry about, it is generally a harbinger of excellence. I’ve never seen wine diamonds to this extent, but this wine was my favorite of the three red-wine Torres samples sent to us, even though the Ibéricos Rioja is promoted on the winery Web site and this one isn’t. 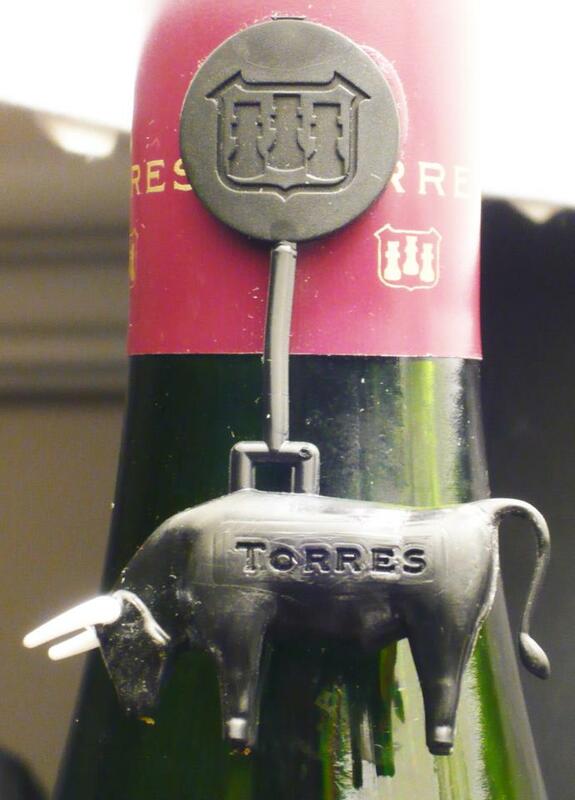 If you need a device to remind you which of the Torres wines this one is, it’s the one with the little plastic bull affixed to the top of the neck. LABEL NOTES: In 1954 my father, Miguel Torres, was already seeking out the most prized grapes of the region to create a different wine that would express the authentic character of the land. This led to the birth of “Sangre de Toro,” whose name is inspired by Bacchus, Roman god of wine, known in ancient times as “Son of the Bull.” SERVING SUGGESTIONS: Perfect with stews, game, meat paellas and the most traditional mountain cuisine. Serve at 18° C [64-65° F]. This entry was posted in Carignan, Grenache/Garnacha, Red Blend, Spain. Bookmark the permalink. 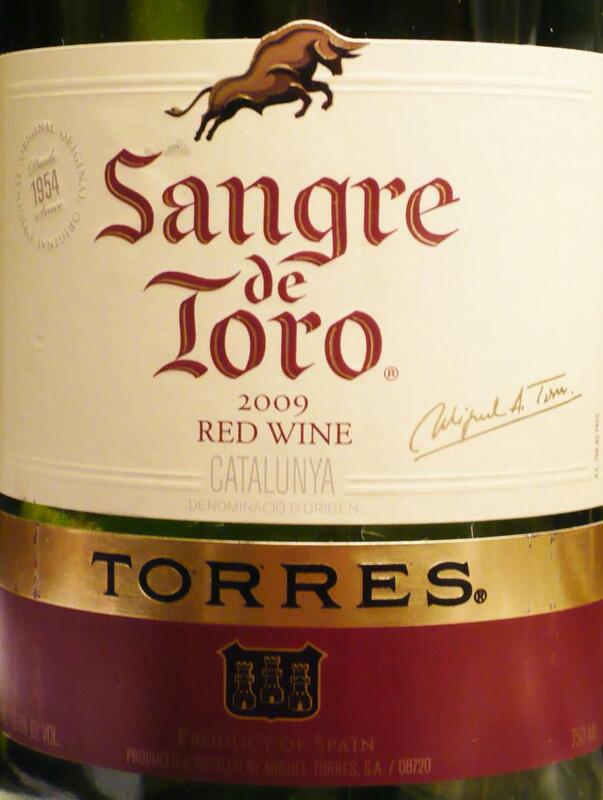 4 Responses to HIGHLY RECOMMENDED: Torres, Sangre de Toro, 2009 Red Wine, Catalunya, Spain. Garnacha and Cariñena blend, 13.5% ABV. $11.99. Who distributes Sangre de Toro in SOUTH AFRICA? Mafa, I don’t know — do your laws allow you to buy it online there? Sorry to bother you, but I am planning a Wine & Cheese party and got this wine at a great deal in the local grocery. The problem is that I am not sure how to pair it with cheese or finger food… Any suggestion? Honestly, if it were me, I would simply buy a variety of cheeses and not worry about it. 🙂 I think the coolest “party trick” I’ve experienced was pairing a big Calif. Zinfandel with an English Stilton cheddar cheese — the wine tasted like cherry candy! That was fun, because it was so interesting.